With our carNAVi Newsletter we send you actual news about carNAVi and other navigation topics. Whether tips about updates, new products or market trends – we’re always informing you regularly but not more than every other month. Get informed about the latest software and map updates and additional maps for your carNAVi and many more. If you would like to read our older newsletters, please click here to open the newsletter archive. Please fill out your name and email address. Our system will send a confirmation mail within a few seconds to verify your email adress and prevent missuse. Please look out for the confirmation email and follow the instructions given to activate your newsletter account. 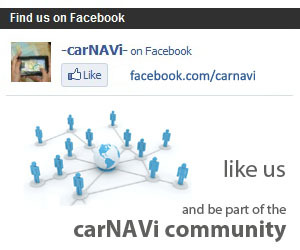 Visit our Facebook page and like us to be part of the carNAVi community. Click here if you would like to change your email address or name.